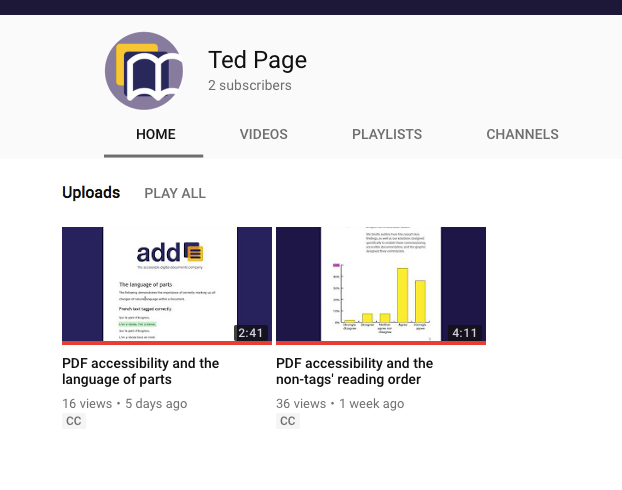 We are delighted to announce the launch of our dedicated PDF and EPUB accessibility YouTube channel. To date we have uploaded just a couple of short how-to videos, but we have plans for many more, covering a range of PDF and EPUB accessibility topics, many of which typically will not be addressed elsewhere. We will post these over the coming months, as time and workloads allow. PDF accessibility and the language of parts, demonstrates the importance of correctly marking up changes of natural language together with how to do so in Microsoft Word, Adobe InDesign and Acrobat Pro. PDF accessibility and the non-tag’s reading order, demonstrates the importance of setting both PDF reading orders (not just the tags order) in order to ensure that PDFs are accessible to all the major assistive technologies. For more on this and its relevance to PDF/UA compliance, please also see our recent blog post PDF accessibility and reading order. Please subscribe to our channel. We hope you will find it useful, informative and entertaining.